The true intention, however, was that the vehicles that are not bound for Delhi are diverted to alternative routes to bypass Delhi; the bench said clarifying its earlier order. Supreme Court of India has issued following directives, in addition to its directions issued vide order dated 9.10.2015, with a view to ‘mitigate the hardship which the people living in Delhi undergo having regard to the high of pollution in the city’. 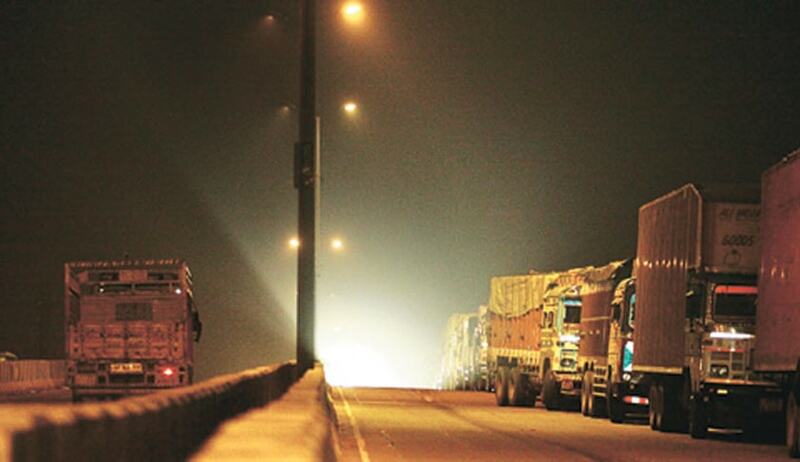 No vehicle which is not bound for Delhi will be allowed to enter from N.H.-8 which connects Jaipur to Delhi and N.H.-1 that connects the States of Punjab, Haryana and other northern States to Delhi via Kundli border. Empty/unladen vehicles bound for Delhi, can enter Delhi on payment of the ECC @ Rs.700/- and Rs.1300/- per vehicle depending upon the category to which the vehicle belongs. For Delhi bound vehicles loaded with goods, the ECC will be twice the charge stipulated by us by our order dated 9th October, 2015. Registration of SUVs and private cars of the capacity of 2000 CC and above using diesel as fuel shall stand banned in the NCR up to 31st March, 2016. Vehicles “bound for Delhi” which are registered in the year 2005 or earlier shall not qualify for entry even on payment of ECC. The State Government and the local bodies concerned including M.C.D., N.D.M.C. and all other institutions that are generating solid waste shall take steps to ensure that no part of such waste is burnt and that proper arrangements are made for disposal of such waste in a scientific way without causing any hazard to environment. On 9th October, 2015, the Apex Court had issued the following directions. The Governments of the States of Uttar Pradesh, Haryana and Rajasthan shall take steps to ensure that commercial traffic for destinations other than Delhi use alternative routes and to ensure that in the course of implementation of the said direction no traffic jams and other inconvenience is 2 caused to the public. The Government of NCT of Delhi shall direct issue advertisements to inform commercial traffic of the bypass routes and the imposition of the ECC imposed by this Court for entry of the vehicles into Delhi. The toll collectors shall put in place Radio Frequency Identification (RFID) systems at their own costs at nine main entry points in the city by November 30, 2015 and by 31st January, 2016 at all the remaining 118 entry points to the city. The NCT Government shall install its own CCTV cameras at nine entry points and also organize surprise visits to oversee the collection of ECC and other necessary arrangements. Category 4 (3 axle trucks) and Category 5 (4 axle trucks and above) at the rate of Rs.1300/- per truck. Upon hearing Sri. Harish Salve, the Amicus curiae, three Judge bench comprising of the Chief Justice T.S. Thakur, Justices A.K. Sikri and R. Banumathi, said that the above directives were understood to mean as though vehicles not bound for Delhi could also enter Delhi provided they pay ECC. “The true intention, however, was that the vehicles that are not bound for Delhi are diverted to alternative routes to bypass Delhi. The levy of ECC has no doubt resulted in some diversion of such vehicles but a very large number of vehicles not bound for Delhi still appear to be entering Delhi on payment of ECC, stipulated by us.”, the bench said.